11949-SS-DST is rated 4.2 out of 5 by 67. Rated 5 out of 5 by GLP13 from Elegant simplicity What we like the most about the faucet is the high round arch design. The ease of installation was great. 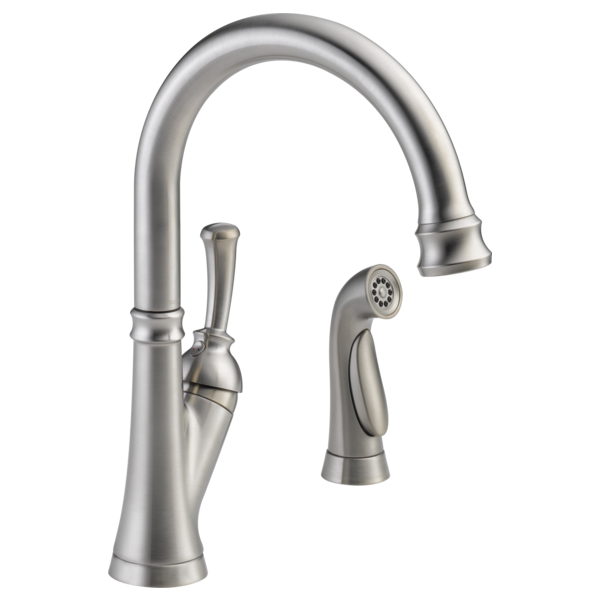 Rated 4 out of 5 by labrat from Solid faucet This is a well made faucet. It has nice style and the sprayer works well. I had to obtain the adapter to plumb the 3/8 inch pex lines to my 1/2 inch plumbing. It would be nice if the adapters were in the box, but I called Delta and they sent them to me. Great customer service. 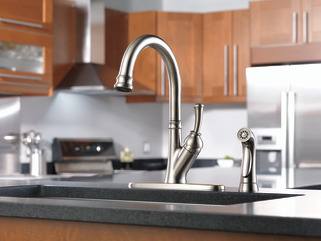 One complaint: The handle MUST be directly and perfectly centered to turn the faucet off. If not, it will drip or run. That's the only thing I don't like and other reviews have mentioned this as well. Rated 4 out of 5 by kaysrn from I like it! So far, so good! Installer had to put handle in backwards due to configuration which is a little weird, but product itself works great! Rated 5 out of 5 by cdjmax from Great Faucet I had new countertops installed with new appliances and this faucet was the cherry on top. 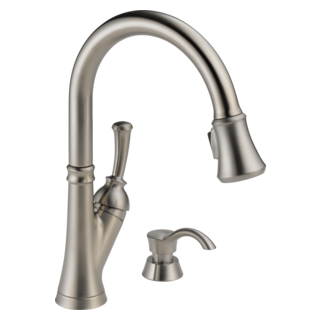 Rated 5 out of 5 by JimW from High Arc - Great Flow If you need room to work under the Kitchen Faucet - this Seville High Arc Faucet will be an excellent choice. Rated 4 out of 5 by JonButcher from No proven longevity So far so good in last 2 months I owed this unit. Time will tell. Rated 5 out of 5 by Barbie from high spigot We bought this 2 weeks ago and I am very satisfied with it. love the way the spigot is higher pots and pans fit under with no problem. Can a water filter such as Pur be attached to a Savile faucet? We haven't had success at finding one that works. The customer service rep that I spoke with sent us an adapter for the Pur filter we have, but I could not get it to work. Can I hook a portable dishwasher to this model if so what do I need. I have already bought the tool to get the aerator out but I can not get the piece to thread. I also bought the RP51505 and can not get that to thread on. Am I missing something? How to I clean the aerator? Or remove it? I installed the side sprayer and discarded the small plastic diverter cap for to the diverter assembly. Now I want to remove the side sprayer and cap it permanently. Is it possible to purchase the diverter cap separately? If not, how else can I cap it? 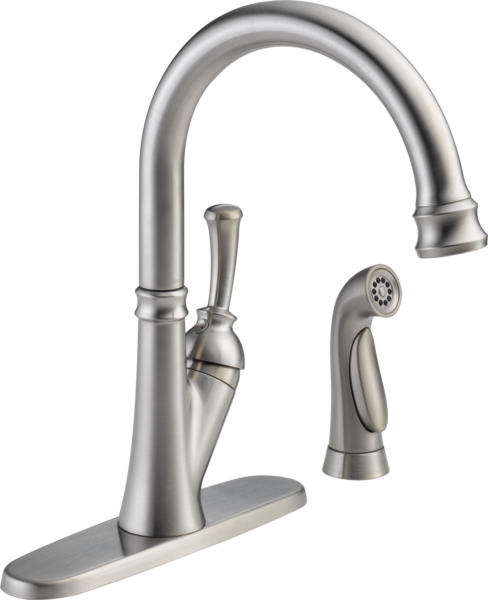 How do I take apart my Delta Sevile stainless faucet. I received a cartridge (part number RP50587) in the mail from customer service but the drawing on the package does not look like my faucet and I can not figure out how to get the faucet handle apart. what product to use to decrease water spots after using? Can this be installed so the handle is on the left side, vs the right as shown? I'm looking to use my existing three holes for the faucet, sprayer and a separate dispenser for filtered water on the right. The left hole is centered over the sink. If there is sediment in the water, can the spout be replaced?